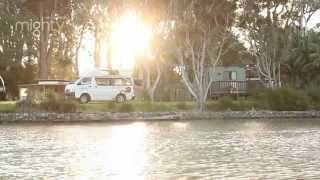 Mighty Campers is part of Australasia's biggest campervan company. At Mighty they help travellers kick start stories by providing the best value, low cost campervans that are simple to use. Combined with an easy self-service check in process that gets you on the road faster, convenient branch locations and 24 hour roadside assistance, they've got you covered. With a range of two, three, four and six berth campervans - grab a camper today and see the Mighty side of life! For a quote on a campervan of your choice please visit the web site or call the helpful staff at Mighty Campers. Microwave yourself some popcorn in this super roomy campervan that sleeps two. Includes a handy toilet and shower so you've got everything you need. Hire the Deuce campervan and get out onto the Australian road today. Great for those travelling in groups or those that want a bit more room. Features top and bottom bunks so you have a slumber party for up to four. Get a quote and book the Double Down 4 berth campervan online today. Sleeps three, more headroom for your early morning stretch. Grill up a feast then clean-up is sorted with a sink on the inside. Plan an Australian road trip with your mates in the Highball 3 berth campervan and book today. The Double Up is less a motorhome and more an inner city apartment on wheels. It's got a toilet, shower and superior cooking facilities. Sleep two above the driver's cab and/or change the back from a dining area into a double bed by piecing together the jigsaw puzzle. Superior motorhome facilities at a Mighty great price. Hire the Double Up 4 berth motorhome today. This six berth is chocka full of great features. Separate sleeping and living areas and the dual cab is great for travelling families. The ultimate in small campers. A fold out bed that can go from dining to snoozing at the push of a button. Your mate can sleep on the nifty fold down hammock. Hire the Jackpot campervan today and head out on an adventure onto the open Australian road. Available from Adelaide, Brisbane, Cairns, Melbourne and Sydney locations only.